If you’re wondering why the New Philharmonic has been silent for most of the year, wonder no more. The orchestra hasn’t disbanded – it has simply been laying low, awaiting the day when its refurbished venue would reopen for business. Audience members will welcome in 2014 with a festive program of waltzes, polkas and other light classics by Johann Strauss Jr., Josef Strauss and others, along with favorite opera arias sung by Ryan Opera Center soprano Emily Birsan. On this occasion, toasting the new year with Champagne and an audience singalong of “Auld Lang Syne” will carry an additional festive cachet: the grand unveiling of the New Philharmonic’s handsomely renovated home. The 800-seat hall, formerly known as the Mainstage, now boasts a new acoustic shell, new seats, new wall treatments and a new stage curtain, along with a custom-designed heating, ventilation and air conditioning system designed to reduce exterior and extraneous interior noise. The renovation is part of a 14-month, $35-million project by the MAC to upgrade its three performance spaces, build a new art gallery and improve the infrastructure and patron service areas. It was funded by a $168-million referendum voters of District 502 passed in November 2010 to cover various bricks-and-mortar projects at the west suburban college. “If I weren’t conducting, I’d go just to wallow in the beauty of the space,” says Muspratt, the bushy-haired maestro who has served as the orchestra’s artistic chief since 2004. The conductor says he believes the auditorium’s somewhat dry acoustics were perfectly adequate for symphonic concerts before the renovation, but can’t predict what the refurbished hall will sound like, since the orchestra has yet to try out its new, mahogany and brass stage shell. 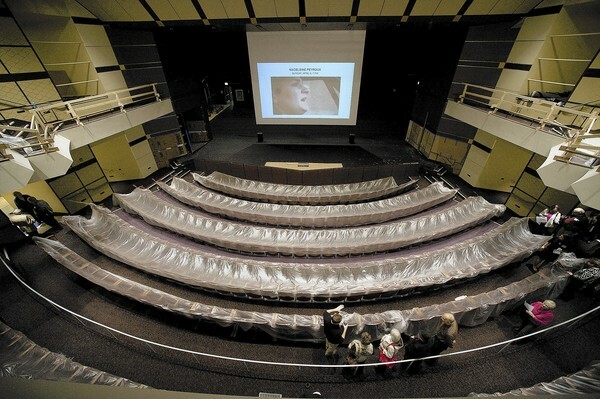 Also renovated were the college’s 184-seat Playhouse Theatre and 80-seat, black-box Studio Theatre. Academic program areas at the MAC also will benefit from the modernization, with work scheduled for completion in February. When the project to bring a 25-year-old, multi-function arts and academic facility into the early 21st century began in fall 2012, Muspratt and his orchestra were forced to assume a nomadic existence. “We became symphonic roadies,” he observes. The orchestra took up temporary residency at concert halls and churches in River Forest and Wheaton but found that a sizable number of patrons were unwilling to follow them to these substitute venues. Ticket sales sagged, forcing management to cancel the remaining 2012-13 concerts in February and March. And uncertainty over when the renovation would actually be completed caused them to reduce the present season’s concerts to three. “Our assumption was that for 24 months we were going to be homeless,” Muspratt explains. “Everybody else occupying the building would be displaced as well, but we were the ones who stood to lose the most.” Although New Philharmonic patrons are intensely loyal, part of that loyalty, he realized, is to the MAC itself. So Muspratt and the staff breathed huge sighs of relief when they learned that major work on the project, including the Performance Hall’s makeover, would be completed several months ahead of schedule. They have wasted no time getting the news out to patrons. The New Philharmonic will complete its current season with an all-Beethoven program under Muspratt’s direction, April 12-13 at the “new” MAC. Kirk Muspratt will conduct the New Philharmonic’s “Viennese Pops New Year’s Eve Celebration” at 4 and 9 p.m. Dec. 31 at the McAninch Arts Center, College of DuPage, 425 Fawell Blvd., Glen Ellyn; $60, $58 senior, $50 youth; 630-942-4000, atthemac.org.